You know it’s coming, we have been covering it for a while now. Faraday Future will unveil its electric car concept on January 4 at 8:00PM PST at the Las Vegas Convention Center. We will be covering the event live. After the unveiling, FF will have a booth in the North Hall from January 6 to 9. GM is set to unveil the production version of the all-electric Chevy Bolt. We’ve already seen it version with recent spy shots, so there shouldn’t be any surprise for the exterior design, though it should be our first look at the interior. 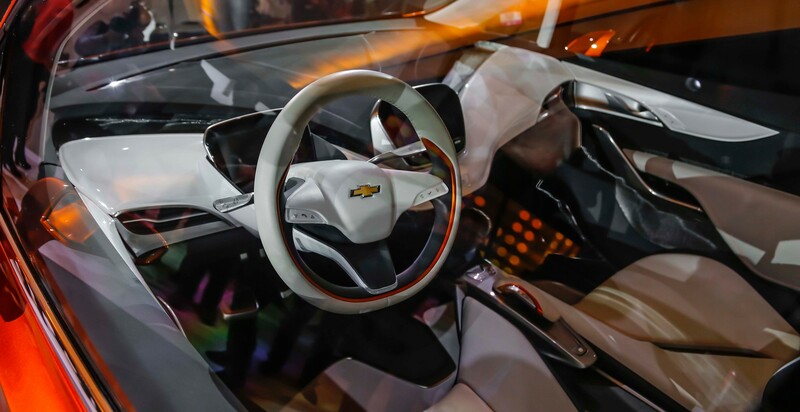 The vehicle is expected to appear during GM CEO Mary Barra’s keynote address for 1 PM Wednesday, January 6 in the Westgate Las Vegas, Westgate Theater. We might get an updated timeline for the vehicle, which is currently expected to hit the market in late 2016 at best, but most likely sometime in 2017. Presumably, Barra should release more information about the trims of the vehicle and if different battery pack sizes will be available. The Bolt is expected to have a range of over 200 miles on a single charge and start at $37,500 before incentives. VW has been teasing it for a while now, but it should finally reveal its long-range all-electric minibus at CES during brand chairman Dr. Herbert Diess’ keynote scheduled for 8:30 PM January 5 at the Cosmopolitan’s Chelsea Theater. In a press release, CES says that Diess will debut a “new era of electric mobility” with his keynote address. We should expect more talking points about VW’s ambitions in the EV sector as the company is moving away from diesel after the recent scandal. Rumor has it that the vehicle will be able to travel more than 200 miles on a single charge and be ready for production in 2018. Ford CEO Mark Fields and CTO Raj Nair will hold a press conference Tuesday, January 5th at 7:30AM Pacific Time. Ford recently announced a $4.5 billion investment in electric mobility and 13 new electric models coming to its lineup by 2020. The presentation should include comments on this effort, but the biggest news coming from Ford at CES should be the announcement of a joint venture to build self-driving cars with Google, according to a recent report. Tesla is a no-show, but maybe something from Panasonic? Tesla Motors doesn’t have an event scheduled at CES, nor does it have a booth for the show. But last year, its partner Panasonic had a Model X alpha prototype at its booth. We will try to stop by the battery maker’s booth this year to see if they are showcasing anything electric vehicle related. Make sure to follow us on your favorite social media to get our latest articles on our coverage of CES 2016: Twitter, Facebook or Google+. You can also follow our reporters live on site in Las Vegas: Seth Weintraub and Stephen Hall.